Want to be notified of new releases in mandubian/play-capistrano? This is a very first draft of a Play module allowing to deploy easily a play app on a remote server with Capistrano, this marvelous remote control tool! Capistrano is written in Ruby and if you are like me, a complete noob in Ruby, you certainly don’t want to write any line of Ruby within a Play application. This module is aimed at that without preventing people more skilled in Capistrano and Ruby to do what they want. run.sh : a simple shell file (yes only linux support currently) containing the command to launch Play server in background. For an unknown reason, it’s impossible to run a background shell command from capistrano directly and you must wrap it into a shell. You can setup team notifications every time a deployment happens through Hipchat by following this tutorial. You can also use Capistrano to deploy to multiple environments (staging, production, etc). For more information, please see this tutorial which goes over the changes necessary on play-recipes.rb you need to make to deploy to multiple environments without the multistage extension. 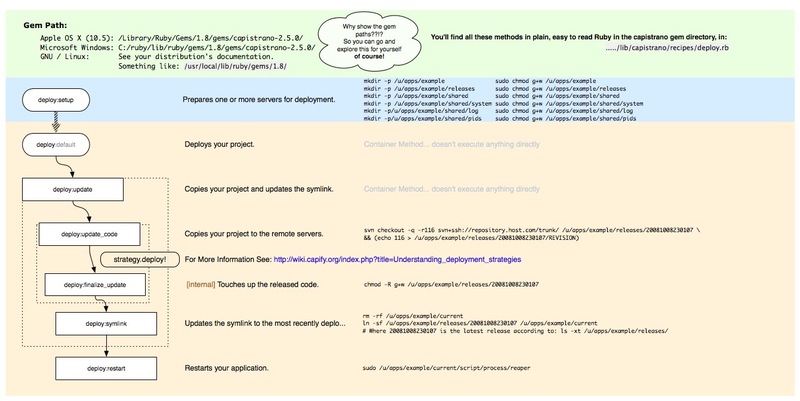 Please find more information on how to deploy to multiple environments on Felipe Oliveira’s Blog. This remote start the server in nohup using the run.sh to make it background. This remote stops the server. This remote stops/starts the server. This “tail -f” remote logs. This kills the remote server. This view remote process info. This retrieves play application pid. This retrieves play application status. This retrieves play application version.